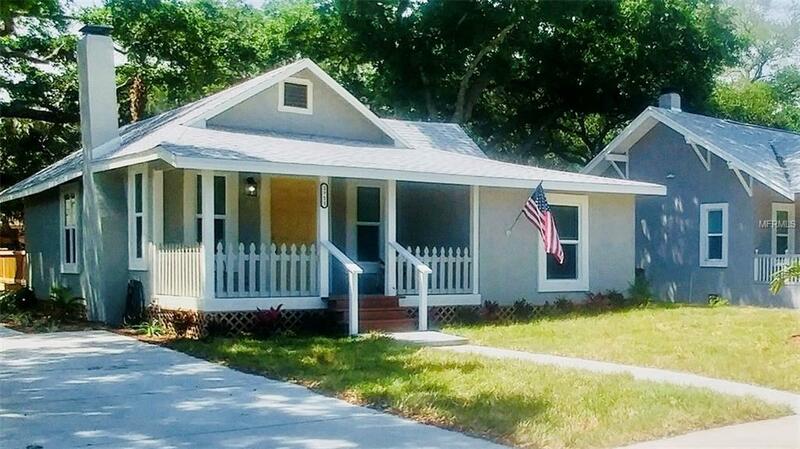 Smashing Bungalow in the Central Cocoanut District north of downtown and south of Ringling College. Complete renovation from the studs out ! Everything is brand new, including the drywall, flooring, all electric and wiring, all plumbing, supply lines, sewer line, fixtures, lighting, electric panel, HVAC and ducts, insulation, roof, kitchen and baths. Impact Glass windows and doors throughout, including new roof straps to save on insurance. Electric fireplace with remote control. Offwhite wood cabinets with contrasting dark granite counters and island. Open concept floorplan from the front door all the way to the kitchen and rear wood deck. New driveway, sidewalk, landscaping, trex deck on front porch. All appliances and mechanical systems are brand new and under warranty and will transfer to new owner. Porcelain tile in baths, Moen fixtures, Jacuzzi tub/shower, frosted glass sliding shower doors, stainless steel appliance package, carpet in bedrooms, wood laminate in main living areas. House has been completely transformed over the past year and professionally managed under the careful eye of a local licensed contractor who is part owner. Everything has been fully permitted through the City of Sarasota and all paperwork and permits are available. Come experience the charm and ambience of a 1925 Bungalow with all the safety and features of a new house.